Debug Graphics Driver allows selectively disabling OpenGL features to identify workarounds for graphics driver bugs. In the absence of such problems, the default settings are generally most appropriate. Reasons to suspect graphics driver bugs include unknown C++ exceptions, error messages mentioning any of the features listed in the dialog at right, visual artifacts such as streaks, very slow response time, crashes, or even failure to start up (more...). 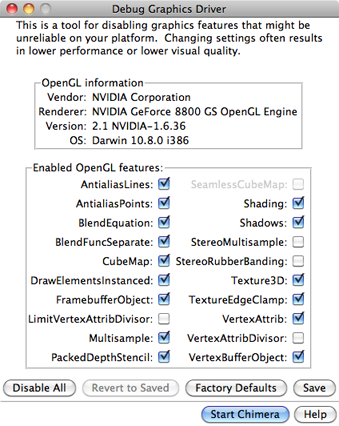 Showing Debug Graphics Driver at startup can also be specified in the General preferences. Grayed-out options are those reported by the system as unavailable. Disable all unchecks all of the options. Factory Defaults populates the dialog with the system defaults. Clicking Save saves the current settings (if different from the factory defaults) in a file named gfxinfo.sav in subdirectory .chimera of the user's home directory (on Windows, this depends on a user's profile but is often C:\Documents and Settings\username\Application Data\). Saving the factory defaults simply removes the file if it exists. Subsequent uses of Chimera will employ the saved settings. Revert to Saved populates the dialog with settings from the previously saved file. Start Chimera starts Chimera with the current settings (without saving them) and dismisses the dialog. Help opens this manual page in a browser window. When exiting Chimera with settings not yet saved, the user will be asked whether the settings should be saved. If yes, gfxinfo.sav will be written as described above, and another dialog will appear asking whether the configuration should be reported to the Chimera developers. Users will be asked about reporting the configuration whenever exiting a Chimera session in which Debug Graphics Driver was initially shown and saved settings were being used. Presumably this mechanism will be used to share settings that successfully alleviate some graphics problem on a particular system. If yes, the process is the same as for bug submission, except the form will be filled in automatically with the saved graphics configuration along with other system information. Including contact information and a description of the problems that were alleviated is optional but encouraged. The report can also be canceled at that stage.